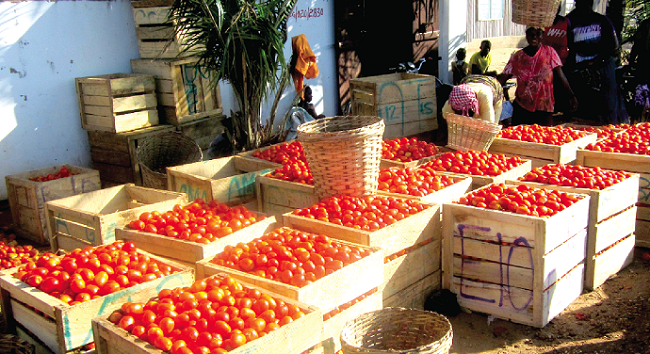 Ghana loses 56 billion CFA to Burkina Faso (BF) through the importation of fresh tomatoes annually, Mr. Eric Osei Tuffuor, the Chairman, Ghana National Tomatoes Traders and Transporters Association (GNTTTA) has disclosed. Mr. Tuffuor was speaking at a meeting of tomato farmers, traders, some executive members of the GNTTTA and Mr. George Oduro, a Deputy Minister of Food and Agriculture at Tuobodom in the Techiman North District of Brong-Ahafo Region. The farmers requested for government’s support in that regard when President Akufo-Addo went to the place last Friday as part of his three day working visit to the Brong-Ahafo Region. Mr. Peter Mensah, the District Chief Executive announced that the Assembly’s application for the establishment of tomato processing factory under the government’s One District, One Factory had been approved. He mentioned to maintain the prevailing peace in the District, the District Security Council (DISEC) had instituted security measures such as the deployment of military personnel in the Tuobodom Township and the presence of Police personnel and city guards to provide effective security at the Tuobodom market. Mr. Mensah therefore entreated the farmers and traders to cooperate with the Assembly in its effort to create a congenial environment for them to do their businesses.